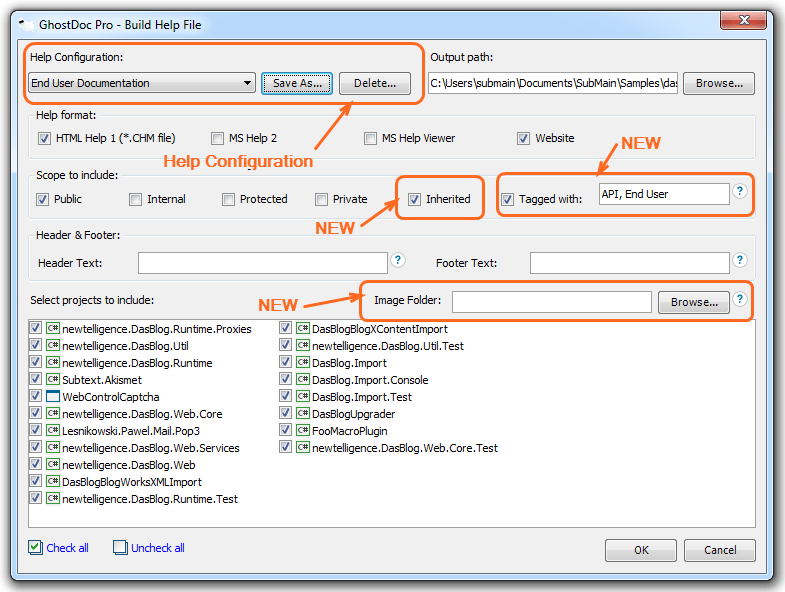 (Pro) Help Content Targeting – ability to create a (partial) ‘filtered’ help file based on attributes by using <tags/> in XML Comment and tag filtering in Help Configuration. If you need to have different help content for public API users, testers, internal documentation, etc, you can do that now! We have identified a clear need for a new kind of GhostDoc product, specifically suitable for enterprises and customers who need advanced configuration features for the help file output. The GhostDoc Enterprise version that we are officially introducing today offers silent deployment options, full customization of the template and layout of the Comment Preview and Help Files. The Enterprise license customers are also eligible for the on-premises Enterprise Licensing Server option. The new Help Configuration feature enables you to create ready-to-use help generation profiles. You can easily switch between profiles, depending on what kind of help you are producing. Also you can define attributes with <tags /> in XML Comment and use tag filtering in Help Configuration to target Help content to your specific audience. Feedback is what empowers us!